Edwin Olson is an Associate Professor of Computer Science and Engineering at the University of Michigan. 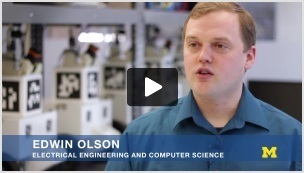 He is the director of the APRIL robotics lab, which studies Autonomy, Perception, Robotics, Interfaces, and Learning. He is also CEO of May Mobility, Inc., which develops driverless shuttles. In 2010, he led the winning team in the MAGIC 2010 competition by developing a team of 14 robots that semi-autonomously explored and mapped a large-scale urban environment. For winning, the U.S. Department of Defense awarded him $750,000. He was named one of Popular Science's "Brilliant Ten" in September, 2012. A few of his awards include the DARPA Young Faculty Award (2013) and the College of Engineering Education Excellence Education Award (2015). He received a PhD from the Massachusetts Institute of Technology in 2008 for his work in robust robot mapping. During his time as a PhD student, he was a core member of their DARPA Urban Challenge Team which finished the race in 4th place. His work on autonomous cars continued in cooperation with Ford Motor Company on the Next Generation Vehicle project. In 2016, he joined the Toyota Research Institute where he was Co-Director for Autonomous Driving Development. In 2017, he left TRI to found a new company, May Mobility Inc., developing autonomous vehicles. He maintains an active research program at the University of Michigan. He is well-known in the robotics community for his work in perception algorithms, mapping, and planning. He was one of the original creators of the middleware package LCM, and the creator of AprilTags, a popular visual fiducial tool. 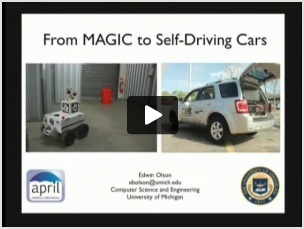 From MAGIC to Self-Driving Cars. The AUVSI Driverless Car Summit, 2012.